Our newly equipped house is situated in a quiet, sunny and centrally located corner of the Zillertal with a magnificent view of the Tyrolean mountains. 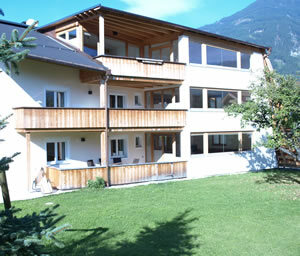 Our three apartments "Healthy Living" are furnitured in a fashionable Tyrolean style. Stone pine furniture guarantees cosiness at the highest stage and provides the background for profound relaxation. The qualities of stone pine wood have been known and used for centuries. The three apartments provide cosiness and comfort for your perfect holiday. All bedrooms are conveniently arranged and have a separate bath room; the family bedroom is additionally equipped with a bath tub. The kitchen is well equipped and provided with a comfortable dinette. The adjacent room is a light-flooded and tastefully furnished living area. As we attach great importance to a child-friendly environment our apartments offer plenty of free space. The large terrace that belongs to the apartment is the ideal place for sun-hungry guests. Your sports equipment can be stored in a storage room that is equipped with special holders for skis and snowboards as well as boot dryers. On-site parking available. In our spacious garden you can spend relaxing hours. 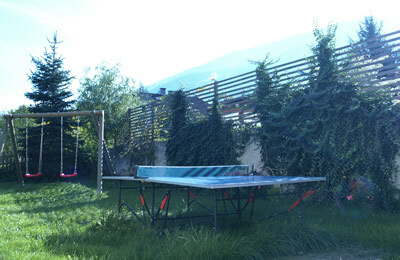 For the young and the young at heart table tennis and swings are available. A barbecue is available for cosy summer evenings. By request, a delivery service for fresh bread rolls is available in the morning.